Use the easy to follow instructions to pop out the pieces, bend the tabs, and connect them at the attachment points. A four-seat, single-engine, high-wing, fixed-wing aircraft. It was first flown in 1955 and is still in production today. 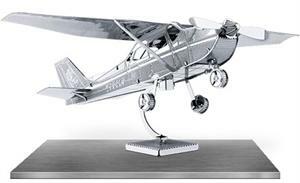 More Cessna 172s have been built than any other aircraft. Touch & Go Pilot Supply Pilot Shop & tagpilotsupply.com. Houston, TX. All rights reserved. Touch & Go Discount Pilot Supply sells complete lines of aviation supplies, pilot supplies, aviation headsets, flight bags, transceivers, pilot gifts, kneeboards, pilot watches, log books, pilot guides and more.